The Goblin King has kept a watchful eye on Toby: His minions secretly guiding and protecting the child… Legions of goblins work behind the scenes to ensure that Toby has whatever his heart desires… Preparing him for the day when he will return to the Labyrinth and take his rightful place beside Jareth as the heir to the Goblin Kingdom… That day has come……but no one has told Toby. My hubby and I are both huge Jim Henson fans. 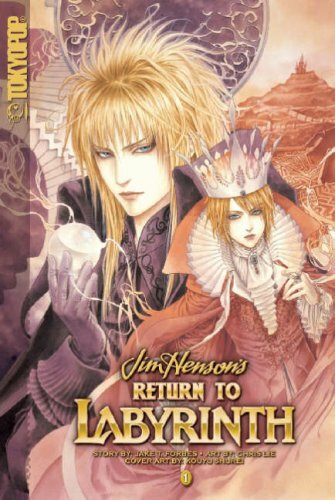 So when we saw that there was a manga series called Return to Labyrinth we had to pick it up. It is wonderful! It really does feel like they picked up years later and kept going. Of course not having do deal with budgets for the creatures and the special effects helps a lot. But the plot is wonderful and has lots of twists and turns. Just like the Labyrinth! There are 4 volumes in all and I can’t wait to read the last one. I think Jim would be proud of it and happy to see that Labyrinth still lives on! You remind me of the babe…..
Love Hina is another manga series that I got into because of the anime. I watched a few episodes back in college and thought it looked interesting. Of course once I mentioned it, I started receiving the manga as presents and so have quite a bit of it (MangaFox filled in the rest). This is such a fun series. Definitely a shojo, but guys might enjoy it as well. I can’t wait to watch the anime and see how they compare. The manga is so much fun and has a great plot that ends just wonderfully! I don’t want to spoil anything, because once you get through the first volume or two, you’re hooked! I first read volume 1 of Immortal Rain when I saw it at the library. This being the library in my hometown, which isn’t very big (both the city and the library) and has an even smaller graphic novel/manga section. When I saw they had some manga that looked interesting, of course I picked it up. Over the years I’ve bought the first four volumes. It’s an interesting little tale that gets more and more interesting as it goes. In many ways it reminds me of Trigun (one of my favorites) with Rain unable to die, his refusal to kill anyone, and his very old feud with a former friend. Also having the short (sorry Meryl! ), young female following him around doesn’t help either. But it’s an amazing and quite original story. Thanks to MangaFox I’ve been able to read father than what’s been published here. I’m thinking of finishing it up soon. It’s a great series. Imagine a Neon Genesis Evangelion where choosing the right girl is more important than saving the world! That’s the gist of Angelic Days – the hit manga that Eva fans have been waiting for! Based on a popular PC and Playstation 2 game released only in Japan, Angelic Days takes the angst-ridden Eva pilots and sets them in a lighter, brighter world. This is a series inspired by Evangelion. Evidently it’s based on one of the dream sequences Shinji has in the last episode. I just thought it was an alternate universe type thing. Either way it’s good so far. The first four books deal with the kids and their friendships. The EVAs and the angels are more background in their lives. Sort of the opposite of the show. 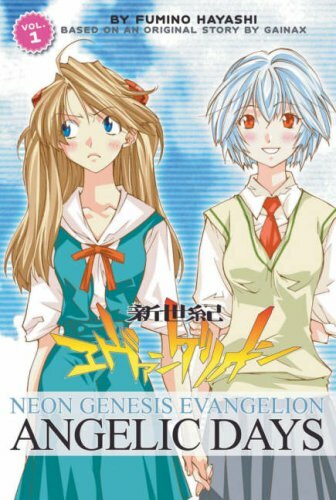 The fifth book is about Shinji’s parents when they were in high school and how that later affects Shinji and his friends in the first three books. Evidently the sixth takes place after the fourth book. It’s back to focusing on the kids and how they’re coping with their roles as pilots as they get older. It’s an interesting series that I think makes a great contrast to the original. The U.S. graphic novel debut of the most controversial “giant robot” series ever produced! A handful of teenagers must pilot huge biomechanical robots — the Evangelion combat units — against monstrous “Angels” bent on destroying humanity. A few years ago a friend gave me the DVD set for Neon Genesis Evangelion because he knew I liked anime and thought I would like it. It’s a wonderful series, and it was revolutionary in many ways when it began. 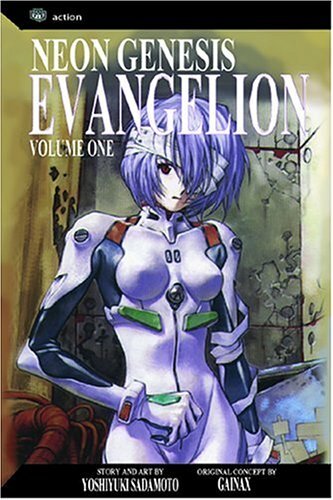 The manga series was started 8 months before the anime was set to start. They first saw it as a way to promote the anime, but it slowly fell behind. 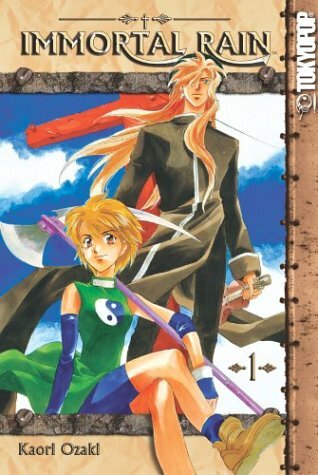 While the series has been done for years, the last volume of the manga has yet to be released. Despite it’s earlier start, it is based on the anime. I haven’t watched the anime for a couple of years now, but what I remember of it, especially the end, is made much clearer in the manga. If you’ve seen the anime and the movies that follow it, you’ll understand this statement: If you’re interested in the series at all, read the manga first! At least don’t let yourself get ahead of the manga in the anime. Things really are clearer in the manga than the anime. I attribute that to the medium, mainly. There is so much more you can put into a picture than into animation. Also, you can easily go back and study a drawing rather than trying to go back and freeze a DVD.